The craft beer scene, flourishing in the U.S., has definitely reached Austria, but how to tell the difference between an Austrian microbrewery and an American one? The owners at the Beaver Brewing Company (BBC) on Lichtensteinstrasse might tell you simply to wear it on your sleeve. 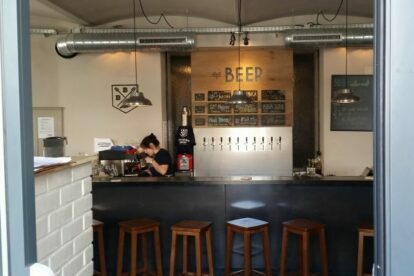 The BBC, a very recent addition to the up and coming Markthalle section of Alsergrund, is an excellent representation of the American microbrewery, both respectful of brewing tradition, yet more willing to experiment than the German beer purity laws typically allow. They offer a nice array of in-house brews, including a few that will definitely be appreciated by non-beer snobs. Amongst others, their Rumspringa, a hoppy lager, threads the needle between an overly bitter IPA and a typical blond. Beers rotate, so as with favorite Game of Thrones characters, don’t get too attached! Luckily, another good one will certainly get its turn to shine. The BBC so far has a very short history, founded 2 years ago by, amongst others, an American science teacher living in Vienna. However, it seems to already have a sizable following, stemming perhaps from its proximity to the nearby American embassy. Ironically, the point that draws me there more than even the beers themselves? American breakfasts on the weekends. I do think Austrians put a good foot forward with brunch, but there is nothing like a sizable American short stack or omelette. The BBC delivers this in spades.